Looking for a relaxing stay in a scenic location? Be transported to sunnier climes at six-bedroomed Villa Marin Hill in Turgutreis, southern Turkey. With its spacious layout and modern interiors. Looking for a relaxing stay in a scenic location? 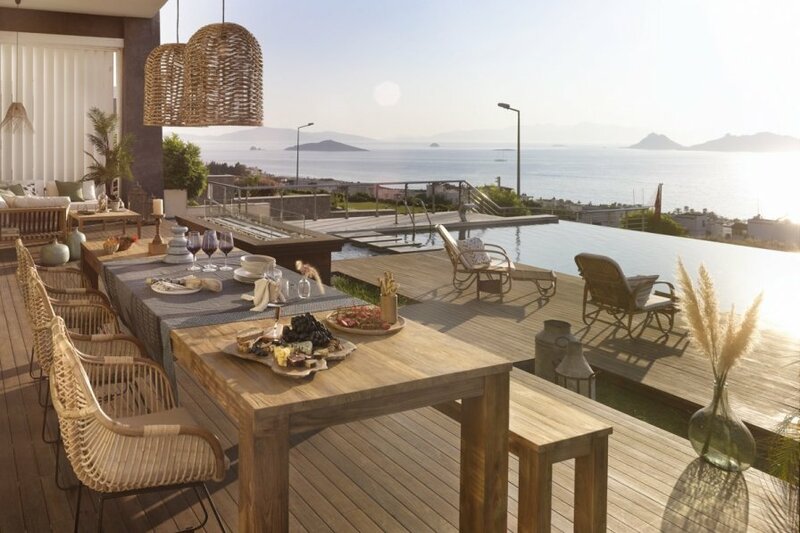 Be transported to sunnier climes at six-bedroomed Villa Marin Hill in Turgutreis, southern Turkey. With its spacious layout and modern interiors, the Mediterranean villa exudes contemporary cool and is perfectly sized for a family-friendly or group stay. Cosy up in the lounge in front of the fireplace; whip up a feast in the sleek kitchen; or gaze over panoramic views of the glistening Aegean from the private outdoor infinity swimming pool. On the ground floor, you'll find a welcoming living room, open-plan kitchen and three of the sumptuous bedrooms. Vanity tables, mirrors and bespoke art pieces create a warm and homely setting, while smart technology helps make your stay an effortless one. Light wood furniture, white walls and natural-coloured furnishings combine to create an elegant interior throughout. There are floor-to-ceiling windows on every level, letting you make the most of those tranquil vistas. On the first floor, there are two bedrooms, as well as another living room and kitchen, while on the next level up there's another lounge, kitchen, bedroom and bathroom. This layout allows families or friends to have a bit of extra space, while still retaining that feeling of togetherness. The final two stylish bedrooms are on the terrace floor. They share a luxurious bathroom and have direct access to the tranquil garden and pool terrace area, where there are plenty of places to sit and unwind. On lazy days, relax in your hammock with your favourite holiday read, take a cooling dip in the pool's crystal-clear waters or find your ideal sunbathing spot on one of the cushioned loungers. On warm evenings, dine alfresco on your shaded outdoor dining table and then stretch out on the cushion-adorned corner sofa. To cap it all, there are local shops and restaurants within a short 200-metre walk, and the nearest beach is 500 metres away. The town centre is a short 1km walk too. - Double bedroom, shower room & wc. - Infinity pool, 12 m x 10 m, depth is 1.5 m.
Villa Marin Hill is in charming Turgutreis, the second largest town on the Bodrum peninsula in Turkey. It's situated along the southern coast and is about a 60-minute drive from Bodrum International Airport. The popular holiday destination is nestled in the mountains and between fruit groves. Spend the morning browsing the town's shops or traditional market stalls before heading to the sandy beach to cool down. For international or local cuisine, there's a scenic waterfront dotted with a selection of cafes and restaurants, so you'll be sure to find something that takes your fancy. Bodrum is about a 30-minute drive away. The vibrant city boasts everything from a beautiful marina to ancient sites and boutique shops, so it's well worth a visit. For a traditional shopping experience, you can visit Bodrum's farmer markets. There you'll find stalls selling everything from hand-made rugs and clothing to fresh produce. For a dose of history and culture, the most prominent ancient site in Bodrum is the castle of St. Peter, dating back to the Knights of St. John. For fantastic views of the city (cameras at the ready), head to the ancient Hellenistic theatre, built into the hillside. When the sun sets, the city comes alive with live music, and there's an abundance of restaurants, bars and clubs. For the sports lovers, there's an 18-hole golf course nearby, as well as tennis courts dotted around the peninsula. You'll also find plenty of opportunities to take part in water sports like sea kayaking, scuba diving and parasailing. Wolf's Point with its rock formations and Big Reef – a prime spot for stingray, groupers and stonefish – are a couple of the city's top dive sites. The pretty harbour at Gumusluk is worth a visit, with lovely fish restaurants around the harbour and ancient ruins in the clear waters. Take swimwear if you want to paddle across to 'Rabbit island'. Nearby days out include Pamukkale with it's travertine formations, the ancient ruins at Ephesus or the pretty restored village of Sirince famed for fruit wine. You could even take a day trip to the Greek Island of Kos.